Bobby & Danine, who we last saw in Tucson a couple of months ago, are up in Oregon after a snowy time in the Olympic Peninsula of Washington. We were in the same area last October and got lots of rain but nice temperatures. It seems they got the tail end of winter on their visit, but they survived and I think had a good adventure. John Irwin, who we saw in Austin just a couple of weeks ago, is back from a Chili Fest rally in Texas, and has filed a report on that. Bert and Janie Gildart, who we hosted at our home in Tucson last month, were recently at the Outdoor Writer’s Conference in Oregon. I think they’re heading home to Montana now, but with them you never can be sure. Rich Charpentier, who accompanied us for several months on the road in 2006, is still settled in Prescott AZ, still living in his Airstream, and seems to be doing well overall despite the occasional health setback. We’re happy for him and talk on the phone often. Mary and Rick Dotson, who we saw in New Orleans a couple of weeks ago when we visited with photographer Rick Olivier, gives her report of that visit here. Jill Smith-Mott and her husband, who came over to the trailer in Austin for a cookout, are apparently still feeling the aftereffects of having met us. Jim Breitinger is now off the road after a year of full-timing, and living in Phoenix in his Airstream. He’s building up a bank account so he can go out again someday, and in the meantime musing on what he’s learned. I last saw him in Quartzsite in January, and I bet we’ll see him again in 2009. Bill Doyle and Larry Ko, friends from San Diego who we have met at Anza-Borrego Desert State Park twice, are still roaming in their Airstream regularly. They have some of the best and most diverse country in their area to enjoy, and they are starting to realize how lucky they are. Their latest report has to do with Earth Day. Sharon Pienak, who we met in South Llano River State Park in Texas not long ago, is still there awaiting repair of her “Silver Snail” so she can get out on the road again soon. I have a feeling we’ll encounter her again this summer sometime. Charon Henning and Alex Kensington, our swordswallowing and fire-eating friends, wrote in last week but neglected to tell us where they are. I think they are on the east coast somewhere. We hope to see them in July at the Vintage Trailer Jam in Saratoga Springs NY. Rick and Judy Vastine, our Tucson friends and fellow homeschoolers, recently announced that we infected them completely, and they are now owners of a used Airstream trailer! We are surprised, excited, and flattered that we were able to have such an affect on them. When we get back west this fall, you can be sure that one of our first trips out of Tucson will be with them. Terry and Greg, another set of Tucson friends and fellow Airstream owners, are making very good use of their trailer. They recently visited Rich Charpentier up in Prescott, but that’s only a fraction of their recent travel. Their goal seems to be to visit every state park that has camping in the state of Arizona and I think they are nearly there. Roger and Roxie, who courtesy-parked us in Visalia CA last December, just got back from a good trip to San Francisco with their Airstream. Roger had to mention that he managed to avoid denting his Airstream on his first solo voyage … something I was unable to do! Here we are sitting in Tampa, taking care of business, and everyone else is out there having what seems to be a more glamorous time, but I’m not jealous. Sometimes we need some time to “just be“, and this is it. It’s a nice feeling to read the reports of our friends who are all over the country, enjoying life, and doing well. I hope they get the same enjoyment out of reading our travels as we do from keeping up with theirs. When we stop in urban areas for a few days, it’s usually to catch up on errands, maintenance, and practical things like work. Tampa has been a favorite stopping point for us over the years because we have so many friends here, including my associate Brett (I like calling him “associate” because it seems mysterious, like he’s mobbed up). Our friends help us get things done in a hurry so we can get back on the road, kind of like having a pit crew. This time the major task was to get the “new” old Honda ready for a 1500-mile trek up to its retirement life in Vermont. I thought it was all set today but we got zapped by bad luck. I took it into a tire shop to get two new tires put on the rear axle, and once the car was on the hydraulic life they discovered that the right front wheel bearing was very loose and needed immediate replacement. Not being born yesterday, I took the car back and did some research of my own, but it soon became clear that they were giving me the straight poop, so back it went to a different shop for the wheel bearing replacement. Once the car was disassembled, they discovered why the bearings were bad: a prior owner had replaced the right axle (half-shaft) with a new one that was slightly too long. They forced it to “fit”, which bent parts of it, and caused the bearings to fail. The cheap car got a lot less cheap today. Without local friends this process would have taken a lot longer, been much more worrisome, and probably cost me more than it did. Full-timing doesn’t really mean you’re utterly independent of everything and everyone; on the contrary, you’re more dependent than ever, or at least more aware of your dependence. We do get by on the kindness of strangers and friends sometimes. That, and credit cards. Our expenses are usually moderate, but when problems crop up, there’s nothing like a high-limit credit card and a zero starting balance to smooth out the bumps. I have known a few people who went out on the road without first resolving their financials, and they’ve all discovered that it is a serious mistake. You want plenty of credit handy and as little debt as possible when you drive out the driveway, because like anything else, you need a safety margin. The unusually high expenses we’ve had lately (tires, car repairs, higher fuel costs) are definitely hurting our budget. When that happens, our answer is to slow down, or pause for a while in an inexpensive place. We can reduce our traveling budget dramatically when we want to. We aren’t forced to drive around at 41 cents per mile. Still, we have promised to get to Vermont by June. Since we have three weeks to do it, we have some options which will cut our budget painlessly. First, we can look for courtesy parking opportunities along our route, and stay for 1-3 days at each one. Courtesy parking each night is like getting a half-tank of gas free (or at least it used to be, now it’s more like 1/3 of a tank). Second, we can drive more slowly. At 60 MPH we can cut our fuel budget by 10% or more. I talked about this a few days ago. Third, we can get to Vermont earlier and start courtesy parking there. If we drive with the minimum number of stops along the way, we can cut a week or two out of the travel plan, potentially saving hundreds of dollars. Eleanor and I will be talking about this over the next few days to develop a strategy. We could even go nuts and cut out a splurge from our trip plan. The obvious thing here is our upcoming stop at Disney World. But instead of deleting too much fun, we’ll probably take one of the less painful options. Courtesy parking with new friends is always fun. And driving slower is hardly a big sacrifice when riding around in a big comfortable car with the iPod playing and the scenery of America going by. Trip update: Today Susan and Adam broke off to get to Disney World a couple of nights early. They haven’t been there in ten years and were really looking forward to going. 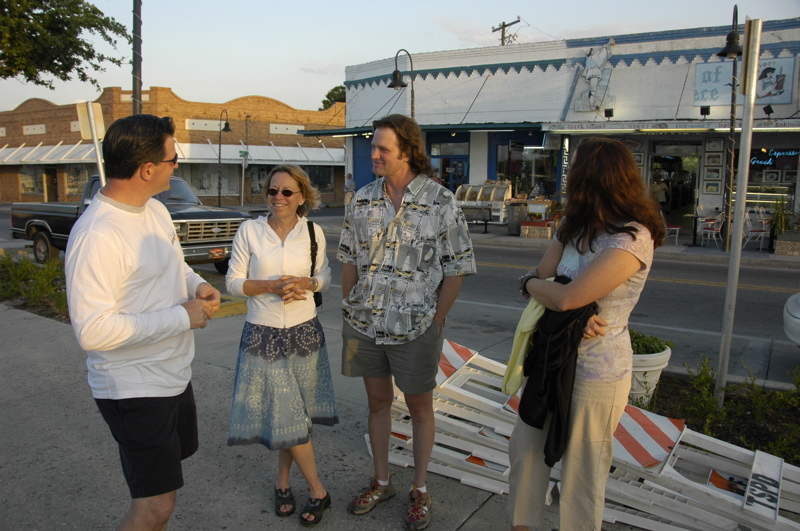 We had taken them to Tarpon Springs a few nights earlier (above), and last night had a big group dinner with all our local friends, so they had some fun in the Tampa area before they left. We’ll catch up with them on Thursday. I’ve just been working (and wrestling with car #3) for the past few days, so we’ve had minimal adventures. Emma has been working on school stuff with Eleanor cracking the whip periodically. We’re all trying to get things done so we can feel very justified in completely dropping everything for a few days at Disney. A big part of the enjoyment of the travel lifestyle has been having fewer things, but for us this trend is reversing lately. First we bought a house, then a second car to keep at the house, and now we have a third car. To be sure, it’s not a glamorous set of wheels. It’s a slate gray 1983 Honda Accord, made back when Accords were smaller than today’s Civics, with a 75-hp engine and crank-up windows. Being a life-long Florida car, the paint is totally dead (closer to battleship gray on top, than the original slate color), but otherwise is in surprisingly good condition. It has just 60,000 miles on it. Terry found it for us in Florida, and we bought it sight unseen a few months ago. He and Brett have been fixing it up for us with new plugs & wires, rotor & cap, hoses, belts, brakes and brake cylinders, valve cover gasket, fluids, filters, wiper blades, freon, and headlights. I picked it up today and put the new license plates on it. It runs perfectly, stops on a dime, and gets great mileage out of a gallon of gas. For a total investment of about $1,800 we have reliable transportation. But what for? We bought this car because we anticipate spending summers in Vermont. A car to run around in is going to be helpful, so this car will be relocated there permanently. The idea of having a third car, when we first thought of it, was frankly a bit annoying. We were doing so well at downsizing our possessions, and then suddenly we felt the need for another car. That’s why the “new” car is such a beater. Even with all the repairs and maintenance, our total investment is less than one-eighth the price of the 2007 Honda Fit we bought for our home base. So it’s perfect for the job: no monthly payment, (hopefully) reliable, not worth insuring for more than liability, able to carry four people, and reasonably pleasant to drive. If it gets dinged in the parking lot we certainly won’t shed any tears for it. When it rusts, which it certainly will do after the first time it gets driven during a Christmas visit, we can accept the inevitable more comfortably than we could with a nicer car. Mostly having it is a strategy to deal with the rising cost of fuel. Our cost per mile when towing has risen to about 41 cents lately, a record high since we started full-time traveling, and it will go even higher this summer. Driving the Nissan around without the trailer currently costs about 24 cents per mile, but with the Honda it is just eleven cents a mile. That really adds up over the course of several weeks, especially in Vermont where driving distances tend to be long. With all the driving we do there, shuttling Emma around to swim classes and visits with friends, driving the beater means a realistic savings of about $120 per week just in fuel, plus it keeps miles off the expensive Nissan Armada that we use to tow the Airstream. 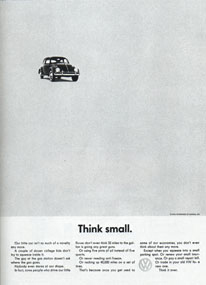 That’s a very good thing, because everything about the Honda is economical, and most things about the Nissan are not. The Honda tires are tiny 13-inchers that cost about $30 each, versus $100 each for the Nissan’s tires. The wiper blades are smaller. The fuel tank is smaller. The oil changes are smaller. The insurance is smaller. And the payment is certainly smaller (zero). Now that I think of it, maybe even though we’ve acquired yet another car, we might be making another move toward a “smaller” lifestyle. In some cases, I guess it’s not about the number of things you own, but how well you make use of them. We’ll see over the next few months if this little experiment pays off. I am always encouraged when I hear someone say, “My parents read your blog every day.” I hear this comment all the time from friends that we’ve either camped with or who have given us courtesy parking. I don’t know why this tickles me, but it does. Today Susan told me her mother reads the blog because it gives her a sense of what’s up with Susan and Adam while they are traveling with us. Welcome aboard, Mrs. W! My parents read the blog, too. We are in Tampa for a few days of urban recreation. Our recent travels through state parks (in New Mexico, Texas, Louisiana, and Florida) have rubbed off on Adam and Susan, and now they want to spend more time in state parks and eschew the commercial campgrounds they used to frequent. So now that we’ve arrived at a very comfortable Tampa RV resort, they are anxious to get back into Florida’s state park system. I have to admit that Florida state parks are among the best in the nation, and we’re only slightly blasÃ© about being in them because we’ve visited so many over the years. But instead of rushing off to another state park, we are taking in those things that are uniquely suburban Florida, and one of those things is the ubiquitous Florida Flea Market. These things are all over the state, and many are huge. Just down the road from our campsite in the town of Oldsmar is one of the biggest. The flea markets are riddled with Chinese knock-offs (sunglasses, toys, tools), questionable antiques, bad food, and sleazy DVDs, but they often also feature great used-book stores, fresh fruit stands, and the occasional genuine bargain. You’ve got to browse the entire thing to find the few diamonds in the dustheap, which is part of the fun. For me, the other part of the fun is getting some kettle corn or a bag of Florida citrus and eating it as I browse. Emma is, of course, not particularly interested in flea markets, but it was a good place for her to collect a few ingredients for her magic wand. The kit she received for her birthday includes a 24-page instruction book with many dire warnings about the risks of making a wand improperly, so she wants to do it right. The interior of the wand must be filled with a personalized mixture of crushed stones, feathers, sand, glass beads, and other items. She bought malachite and moonstone for her wand, and collected some pure white sand from the ground. With Adam and Susan we have discovered the joy of making pizza on the grill. Eleanor bought a bunch of little flatbreads at the supermarket and in the afternoon Adam grilled up a bunch of vegetables (Portabello mushrooms, eggplant, onions, etc) and assembled a variety of ingredients, including fresh tomatoes, sun-dried tomatoes, tomato sauce, Kalamata olives, olive tapenade, Gorgonzola cheese, mixed shredded cheese, fresh pears, raspberries, walnuts, dark chocolate, Amaretti cookies, roasted red peppers and roasted green peppers. This is a lot of fun. You cover a flatbread with a mix of ingredients and slide it onto the hot grill for a few minutes, then slice it up and let everyone try it. Since the pizzas are small and the crusts are thin & crispy, you can try a lot of different pizzas before you get full. We took turns creating new pizza mixtures, finally ending up with a few “dessert pizzas” featuring chocolate bits, pear, cookie bits, and yogurt. This is a great thing to do with a crowd, since everyone can contribute to the cooking, even kids, and the new pizzas just keep coming out every 2-3 minutes. As it got dark, I brought out the uke and Adam broke out his bongos, and we experimented briefly with the concept of a uke/bongo combo. There’s some potential there, but I’ll have to get better at different strumming patterns. When I say “potential” I mean potential to make some interesting (to us) music, and potential to drive away unwanted neighbors in the campground. If ukulele is an un-acquirable taste, as my curmudgeonly friend Dr C claims, uke/bongo must certainly fall into the same category as our pear and Gorgonzola pizza: strange-sounding but really delicious if you try it. We had a sense that it was a shame to leave St Andrews after only three nights. As Susan said, “I feel like I could spend two weeks here.” It really deserves its reputation as a great place. We’d just barely scratched the surface with the boating and bicycling, and a few hours on the beach, although I wonder if we’d have liked it half as much during Spring Break season. Getting out of the park we encountered a “dump station delay,” which happens once in a while. Most of the time a stop at the dump station is a brief event, but at popular campgrounds you can get stuck in a line. This time the line was two Class A motorhomes ahead of us. They take longer at the station because of their much larger tanks, but in this case the first guy in line was one of those extremely meticulous types who takes 15-20 minutes to do the job. After an extraordinary procedure which I won’t go into, he loaded his sewer hose into a plastic basket and proceeded to wash the outside of the hose. I’ve never seen that one before. I have to admit that the hose looked like new, but I’m not sure why that is important. Then the next Class A rolled up and a guy got out at such a slow speed that he should be careful not to get run over by a glacier. We decided we didn’t need to dump that badly, and headed out. There are two ways to get from Panama City to Tampa. You can head north to I-10 and drive through Tallahassee, or you can take the scenic (and shorter distance) route of Rt 98 following Florida’s Big Bend. We opted for the scenic route and got rewarded by nice views, a bit of construction delay, and better fuel economy. The latter was important since fuel in that area is currently running $3.69 per gallon. We’re going to have to think carefully about our routing going forward. Highways with high speed limits (as in the western states) are bad for our fuel economy. We do better taking the slow roads, even with the occasional stop sign and traffic light. Anything over 65 MPH dings our fuel bill pretty badly. The only time we were in Manatee Springs State Park (29 °29’19.55″N 82 °58’34.98″W) was two years ago when Eleanor was having a massive migraine. We stopped for a few hours in the afternoon to let her sleep, but didn’t camp there. Eleanor doesn’t remember the visit, so I wanted to give us all a chance to recapture the place in a healthy moment, and for me, replace that grim memory with some nice ones. The park features a first-magnitude freshwater spring that runs into the Suwannee River. In the colder months, manatees swim upstream to this spring and others like it in Florida to escape the cold seawater, and so you can easily spot them here. 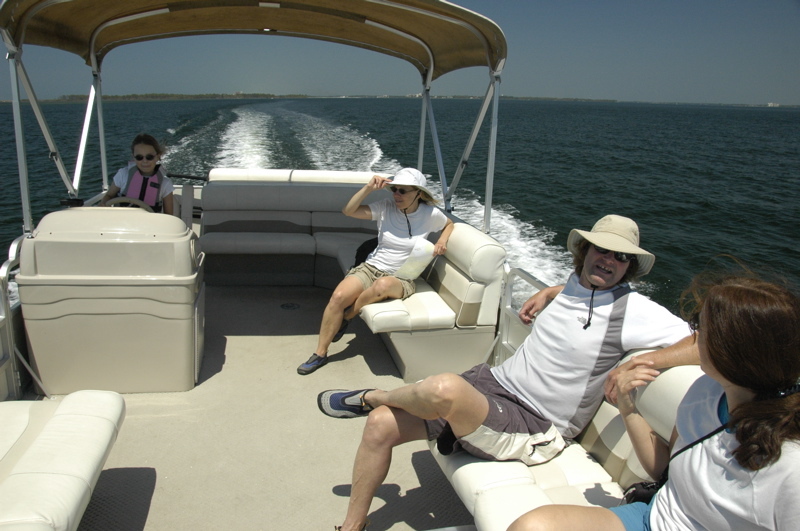 April, however, is the end of the manatee season and during this visit we didn’t see any. Instead, the water was alive with mullet, placidly floating in the crystal-clear water and facing upstream like a football team awaiting the kickoff. The mullet jump out of the water at random and clear often clear it by a foot or two, which is fun to watch. Sturgeon are also found here, but not during our visit, and deer were as plentiful as squirrels. This morning we dragged Emma out of bed (an hour earlier than she was ready for, because we crossed into Eastern Time yesterday), and Adam, Emma, and I all climbed into the 72 degree water at the headwaters of the spring for a morning snorkel. I can recommend this practice. There’s nothing like a swim in the morning to start off a great day. Of course, a wetsuit makes the water a lot more pleasant. Perhaps having a serene feeling helped me deal with what came next. Just a few miles from the campground, our brake controller stopped working. I touched the brakes and that reassuring tug from the trailer wasn’t there. Then I stepped harder on the brakes and felt the trailer pushing against us as we drifted to a stop at the red light. Those of you who have followed this blog can probably appreciate my feeling when I realized, in traffic, that we had once again lost our brakes. This time it was not on a downhill ramp in the rain, but the feeling of “omygodherewegoagain” certainly was overwhelming all the same. I flashed back to the last time, in Oregon, when the brake actuator suddenly died, and how we ended up waiting for days for a replacement unit to be shipped in, and then dealt with brake bleeding aggravation for days afterward. We radioed Adam and Susan, who were behind us, and pulled over in the next available dirt lot for an inspection. I checked all the obvious culprits: trailer umbilical connection, corrosion on the contacts, fluid level on the actuator, wire connections to the actuator, fuses, but everything was fine. So I called up Actibrake’s tech support and asked for help, fearing the worst. Being Friday, I could just see us parked at the nearest campground for the next four days awaiting a replacement unit again. Fortunately, Mike Adamietz of Active Technologies was a real pro, and very calm. (I was trying not to get really upset, but I’m sure some of my stress leaked through the phone.) He ran through the troubleshooting checklist, but I had checked everything on it already, except the last item. The unit was making a light “thump” sound every few seconds for a minute or two after we stopped. Mike recognized this as a possible low-voltage condition and asked me to check the trailer ground wire. I had never looked at our ground wire, even though it is located out in the open in front of the trailer. This is the ground for everything in the trailer’s 12v system. Since the other 12-volt appliances in the trailer worked fine, I had not considered it, but it turns out that the actuator pulls a hefty 15-20 amps, and so a corroded ground can affect it before anything else appears awry. Sure enough, simply by removing the ground wire, brushing it briefly with copper wool, and replacing it, the problem was solved. I can’t begin to describe my relief. I was also grateful to have a pair of supportive friends behind us (along with the ever-supportive family), and glad that Mike was right there to help us over the phone. So with that, we proceeded down the road to Tampa, with that reassuring disc braking feeling once again. The ground wire is such an easy maintenance item and so important that Eleanor and I shot an instructional video on it, and posted it on the Airstream Life media community. You can see it here. St Andrews State Park has been unexpectedly full of interesting creatures to see, and I’m not talking about the other campers. 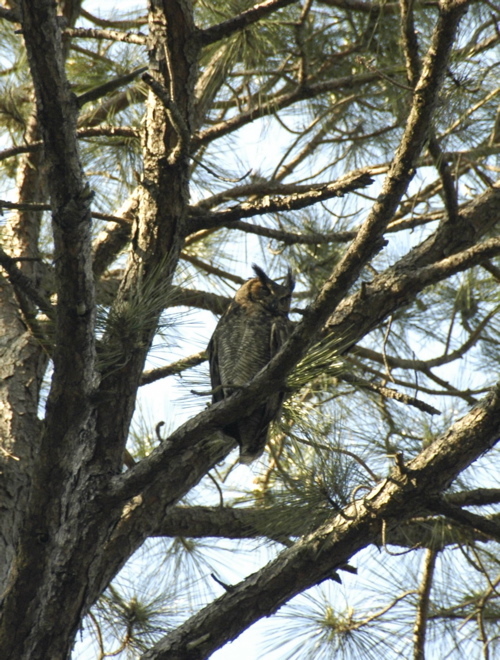 Across the way from our campsite a pair of baby Great Horned Owls fell from their nest high in a pine tree, and (since their mother was unable to retrieve them) they have been relocated to a box a bit lower down in a pine tree where everyone can see them. They spend most of their day sleeping, as nocturnal birds should, but like good babies they wake up randomly to take a look around. They are growing rapidly, according to campers who have been here for a week or more. Mother Owl keeps an eye on them from her perch far above. This photo is a crop of a 200mm zoom shot without a tripod, hence some blurriness. She’s never far away from the nest, and occasionally the presumed father has been spotted around the campground too. We never saw that Great Horned Owl in Tucson but at least we are finally seeing one here. 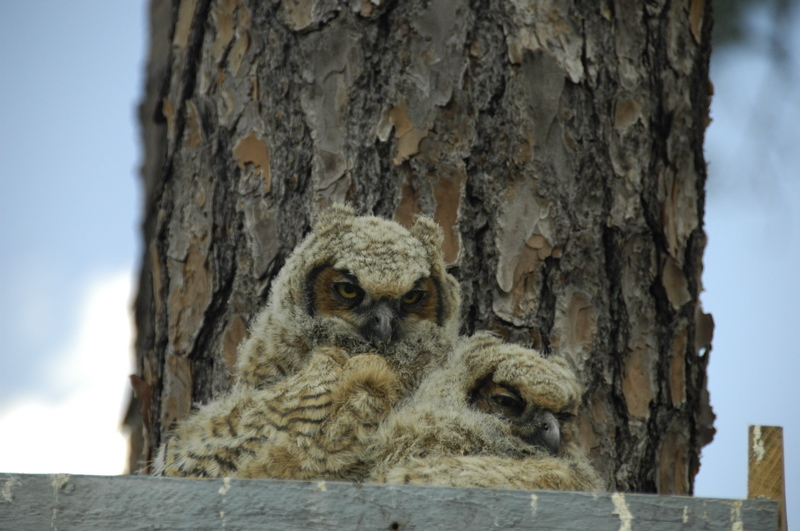 It’s fun to walk out of the trailer during the work day to go watch the fluffy owl babies snoozing in their nest. 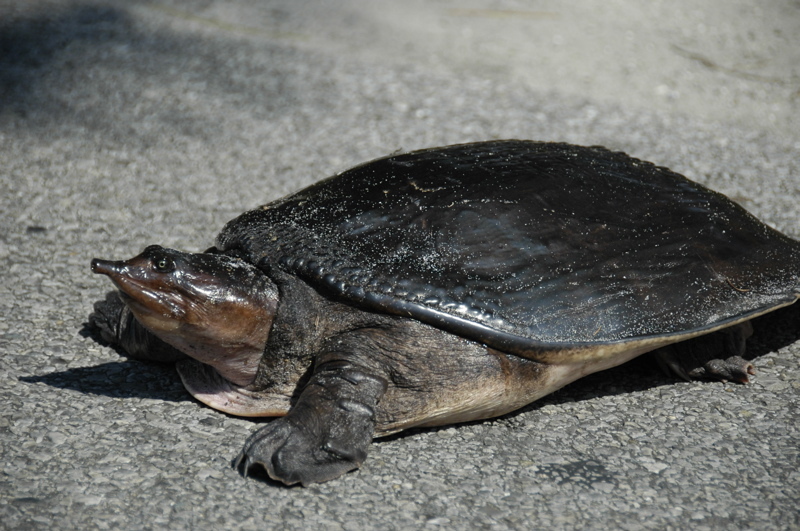 As expected, I did spend the day at work, but for an hour in the afternoon I broke away with Adam for a bicycle ride, and during that we spotted this fellow, a Florida softshell turtle. He/she was talking a stroll across the road but was apparently struck by indecision midway through. Note the unusual pointed snout on this distinctive Florida species. Apparently these turtles can be rather aggressive, but a state park worker soon came by and lifted the large turtle with bare hands, and carried him off to the side of the road. The turtle didn’t smile about it, but he satisfied himself with a half-hearted nip at the worker and thereafter tolerated the ride. This evening around sunset I plan to take the tripod over to “Gator Lake” and see if I can spot some alligators. It’s a long shot but a worthy photographic exercise. Even if I get nothing I’ll still get a photography lesson out of it. By the way, Emma’s big gift last night was a Fluke pineapple ukulele. She also snagged several books, including two about dragons and a magic wand-maker’s kit. That cheap tourist uke I had handed down to her sounded just awful, so I’m hoping this better one will further encourage her learning. I just have to resist the temptation to monopolize it, because it sounds so good. 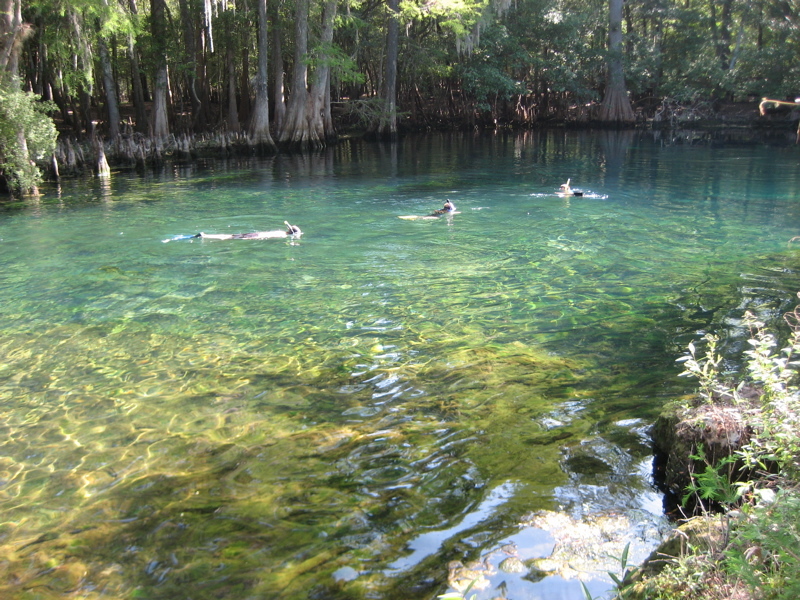 Tomorrow we are heading out to Manatee Springs State Park, halfway around the bend of Florida. There is no cellular or Internet service there, so it’s likely I won’t be able to update the blog until Friday. Adam came up with an idea for Emma’s birthday, to rent a pontoon boat and head out on the relatively calm water of St Andrew’s Bay. I had gotten up early to do some work, so by the time we were ready to head out at about 11 a.m., there was enough work behind me to justify blowing off the rest of the day and hitting the water. 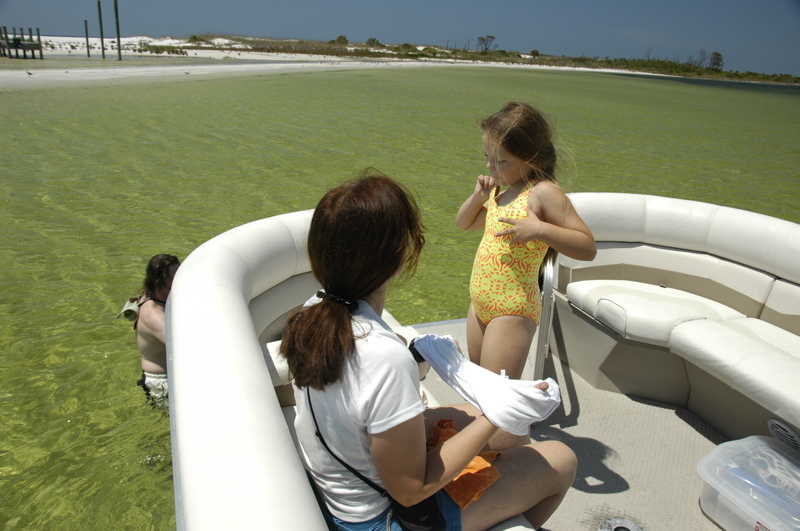 From the state park you can rent boats for the day and roam around the bay, stopping off at Shell Island and snorkeling in the sandy shallows. Since we had a reliable captain with us (pictured above) who today has turned eight years old, and the weather was fine, it seemed like an ideal thing to do. So we packed up our gear, some food, and a lot of sunscreen, and took off. Shell Island is fairly good for shelling, but not amazing. The island is an uninhabited sand barrier facing the Gulf of Mexico, with green water and dazzling white sand on the Gulf side, and yellowish sand on the Bay side. It’s an easy place to chuck out the anchor and wade to. A bit further east we found the sandy snorkeling spot that we’d heard about. (Approximate coordinates: 30 ° 5’14.54″N 85 °39’0.37″W) No tropical fish here, but plenty of sand dollars, starfish, sea urchins, and a crab or two. The wind picked up and it got to a one foot wave, but after borrowing her mother’s dry snorkel, Emma did very well. To the west we entered the commercial part of the bay over by Audubon Island and checked out a large ocean-going container ship which was being loaded, as well as a lot of extravagant water-side houses. Six hours on the boat vanished in no time. 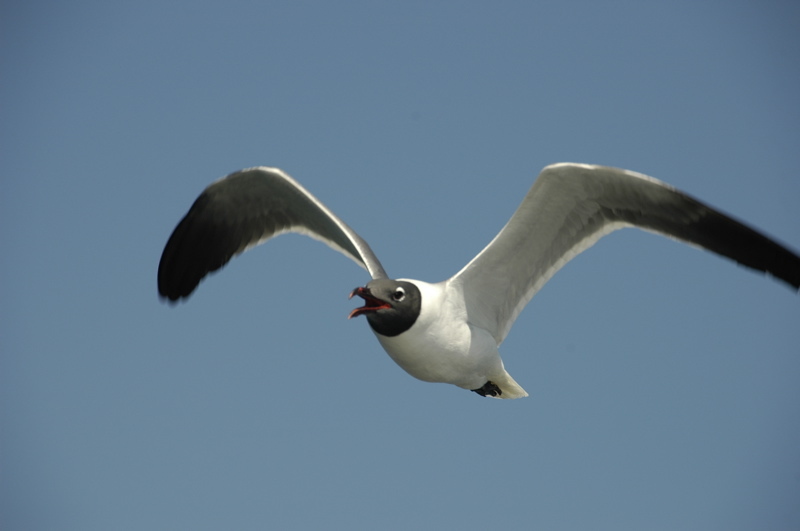 The photo above is of a Laughing Gull that adopted us for a few minutes as we were cruising. He seemed to want a handout. Emma has had a great birthday so far, but there’s more to come as I write this. She and Eleanor are working on a cake now (tip for those who would bake in their RVs: make sure you are absolutely level! ), and tonight she has a few presents to open. Since we were able to extend our stay, we’ll be here for two more nights, which means some time to explore the park tomorrow, at least for everyone except me. I will have to pay the price for not working a full day today, by making up for it tomorrow.